The Elizabeth Tower, formerly known as the Clock Tower, is the world's largest four-faced, chiming turret clock. The structure is situated at the north-eastern end of the Houses of Parliament building in Westminster, London. It is often mistakenly called "Big Ben"—which is actually the main bell housed within the Elizabeth Tower. The clock tower has also been referred to as St Stephen's Tower. Although not as historical a London landmark as the Tower of London or London Bridge, the tower with its Great Bell has become all bit synonymous not only with the City of London but also with the Houses of Parliament and the democratic institutions accommodated there. Buildings and monuments often come to represent the spirit of the cities which they symbolize. Big Ben perhaps represents the heart beat of the Mother of Parliaments, which beats during peace and war constantly, boldly and with precision, just as the nation governed from beneath its tower rises to whatever challenge confronts it with steady and courageous hands. The tower was raised as a part of Charles Barry's design for a new palace, after the old Palace of Westminster was destroyed by fire on the night of October 16, 1834, when an abacus used for the purposes of bookkeeping was being destroyed. However, although Barry was the chief architect of the palace, he turned to Augustus Pugin for the design of the clock tower, which resembles earlier Pugin designs, including one for Scarisbrick Hall. The design for Big Ben was, in fact, Pugin's last design before his final descent into madness and death, and Pugin himself wrote, at the time of Barry's last visit to him to collect the drawings: "I never worked so hard in my life for Mr Barry for tomorrow I render all the designs for finishing his bell tower & it is beautiful." The tower is designed in Pugin's celebrated Gothic revival style, and is 96.3 metres (315.9 ft) high. The first 61 metres (200 ft) of the structure is the Clock Tower, consisting of brickwork with stone cladding; the remainder of the tower's height is a framed spire of cast iron. The tower is founded on a 15 metres (49 ft) square raft, made of 3 metres (10 ft) thick concrete, at a depth of 7 metres (23 ft) below ground level. The four clock faces are 55 metres (180 ft) above ground. The interior volume of the tower is 4,650 cubic metres (164,200 cubic feet). The tower contains cells in which members of Parliament can be imprisoned for a breach parliamentary privilege, although rare. Due to ground conditions present since construction, the tower leans slightly to the north-west, by roughly 220 millimetres (8.66 in) at the clock face, giving an inclination of approximately 1/250. Due to thermal effects it oscillates annually by a few millimetres east and west. The clock faces were once large enough to allow the Clock Tower to be the largest four-faced clock in the world, but have since been outdone by the Allen-Bradley Clock Tower in Milwaukee, Wisconsin. The builders of the Allen-Bradley Clock Tower did not add chimes to the clock, so the Great Clock of Westminster still holds the title of the "world's largest four-faced chiming clock." The clock mechanism itself was completed by 1854, but the tower was not fully constructed until four years later in 1858. The face of the Great Clock of Westminster. A 1.63 metre (5 ft 4 in) person has been inserted into the picture at correct scale. The hour hand is 2.7 metres (9 ft) long and the minute hand is 4.3 metres (14 ft) long. The clock and dials were designed by Augustus Pugin. The clock faces are set in an iron framework 7 metres (23 ft) in diameter, supporting 312 pieces of opal glass, rather like a stained glass window. Some of the glass pieces may be removed for inspection of the hands. The surround of the dials is heavily gilded. At the base of each clock face in gilt letters is the Latin inscription: "DOMINE SALVAM FAC REGINAM NOSTRAM VICTORIAM PRIMAM," which means 'O Lord, keep safe our Queen Victoria the First'. During World War II, the Palace of Westminster was hit by German bombing, destroying the Victorian House of Commons and causing damage to two of the clock faces as well as sections of the tower's steeped roof. The main bell, officially known as the Great Bell, is the largest bell in the tower and part of the Elizabeth Tower, formerly known as the Great Clock Tower. The bell is better known by the nickname Big Ben, which is often mistakenly applied to the clock tower itself. The Clock Tower was also referred to as St Stephen's Tower. The name Big Ben was given to a 14.5 tonne (16 ton) hour bell, cast on April 10, 1856 in Stockton-on-Tees by Warner's of Cripplegate. The bell was never officially named, but the legend on it records that the commissioner of works, Sir Benjamin Hall, was responsible for the order. Another theory for the origin of the name is that the bell may have been named after a contemporary heavyweight boxer Benjamin Caunt. It is thought that the bell was originally to be called "Victoria" or "Royal Victoria" in honor of Queen Victoria, but that an MP suggested the nickname during a Parliamentary debate; the comment is not recorded in Hansard. The original bell cracked during testing, and its metal was recast at the Whitechapel Bell Foundry on April 10, 1858 as the 13.76 tonne (13.54 ton (long), 15.17 ton (short) bell, which stands at a height of 2.2 metres ( 7 ft. )with a diameter of 2.9 metres (9 ft.), and it is still in use today. The new bell, which chimes on A, was mounted in the tower alongside four quarter-hour bells, the ring of bells that ring the familiar changes. Along with the main bell, the belfry houses four quarter bells which play the Westminster Quarters on the quarter hours. The four quarter bells are G sharp, F sharp, E, and B (see note). They play a 20-chime sequence, 1-4 at quarter past, 5-12 at half past, 13-20 and 1-4 at quarter to, and 5-20 on the hour. Because the low bell (B) is struck twice in quick succession, there is not enough time to pull a hammer back, and it is supplied with two wrench hammers on opposite sides of the bell. A 6 metre (20 ft) metal replica of the clock tower, known as Little Ben and complete with working clock, stands on a traffic island close to Victoria Station. Several turret clocks around the world are inspired by the look of the Great Clock, including the clock tower of the Gare de Lyon in Paris and the Peace Tower of the Canadian Parliament Buildings in Ottawa. A clock tower similar to Big Ben is the Joseph Chamberlain Memorial Clock Tower of the University of Birmingham, England. Often referred to as "Old Tom" or "Old Joe," it is around three quarters of the size of Big Ben. Its four faces are each 17 feet in diameter. Baby Big Ben is the Welsh version of Big Ben at the pierhead in Cardiff. Its mechanism is almost identical to the one which powers the Big Ben clock in London. There are other replicas, one of the finest is a two-third exact replica of the movement made by Dent located in the Queens Royal College Trinidad. There is another in Zimbabwe. The clock is famous for its reliability. This is due to the skill of its designer, the lawyer and amateur horologist Edmund Beckett Denison, later Lord Grimthorpe. As the clock mechanism, created to Denison's specification by clockmaker Edward John Dent, was completed before the tower itself was finished, Denison had time to experiment. Instead of using the deadbeat escapement and remontoire as originally designed, Denison invented the double three-legged gravity escapement. This escapement provides the best separation between pendulum and clock mechanism. Together with an enclosed, wind-proof box sunk beneath the clockroom, the Great Clock's pendulum is well isolated from external factors like snow, ice and pigeons on the clock hands, and keeps remarkably accurate time. The idiom of putting a penny on, with the meaning of slowing down, sprang from the method of fine-tuning the clock's pendulum. The pendulum carries a small stack of old penny coins. Adding or subtracting coins has the effect of minutely altering the position of the bob's centre of mass, the effective length of the pendulum rod and hence the rate at which the pendulum swings. Adding or removing a penny will change the clock's speed by 2/5th of one second per day. Despite heavy bombing the clock ran accurately throughout the Blitz. It slowed down on New Year's Eve 1962 due to heavy snow, causing it to chime in the new year 10 minutes late. The clock had its first and only major breakdown in 1976. The chiming mechanism broke due to metal fatigue on August 5, 1976 and was reactivated again on May 9, 1977. During this time BBC Radio 4 had to make do with the pips. It stopped on April 30, 1997, the day before the general election, and again three weeks later. On Friday, May 27, 2005, the clock stopped ticking at 10:07 P.M., possibly due to hot weather (temperatures in London had reached an unseasonal 31.8 °C (90 °F). It resumed keeping time, but stalled again at 10:20 P.M. and remained still for about 90 minutes before starting up again. There were other short stoppages but the practice of the publicity department of the Houses of Parliament to attribute problems to weather and other reasons outside of their control makes it difficult to be sure why. Ex-employees of Thwaites & Reed who looked after the clock for 30 years say problems were caused by a major overhaul for the millennium being shelved and never done. Thwaites & Reed say they have the exact details of what was needed, but they seem reluctant to make public their records even though their older records are on loan to the Guildhall Library in London for everyone to see. In 2005, a terrorist manual was found in the home of Abu Hamza al-Masri, marking Big Ben, the Statue of Liberty and the Eiffel Tower as terrorist targets. In his trial at The Old Bailey in 2006 he denied all knowledge of their being targets. On August 11, 2007, Big Ben went silent and temporarily also stopped keeping time for maintenance that lasted one month. The bearings that help sound the chime on each hour were replaced, for the first time since installation. During the maintenance works, the clock was not driven by the original mechanism, but by an electric motor. Once again, BBC Radio 4 had to make do with the pips during this time. The Clock Tower is a focus of New Year's Day celebrations in the United Kingdom, with radio and TV stations tuning to its chimes to welcome the start of the year. Similarly, on Remembrance Day, the chimes of Big Ben are broadcast to mark the 11th hour of the 11th day of the 11th month and the start of two minutes' silence. For years ITN's "News at Ten" began with an opening sequence which featured the Clock Tower and Big Ben with the chimes punctuating the announcement of the news headlines. The Big Ben chimes are still used today during the headlines and all ITV News bulletins use a graphic based on the Westminster clock face. Big Ben can also be heard striking the hour before some news bulletins on BBC Radio 4 (6:00 P.M. and midnight, plus 10:00 P.M. on Sundays) and the BBC World Service, a practice that began on December 31, 1923. The chimes are transmitted live via a microphone permanently installed in the tower and connected by line to Broadcasting House. Londoners who live an appropriate distance from the Clock Tower and Big Ben can, by means of listening to the chimes both live and on the radio or television, hear the bell strike 13 times on New Year's Eve. This is possible due to the one strike offset between live and electronically-transmitted chimes. Guests are invited to count the chimes aloud as the radio is gradually turned down. 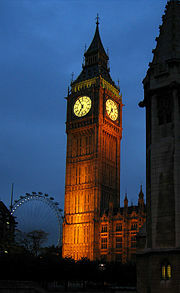 The clock has become a symbol for the United Kingdom and London, particularly in the visual media. When a television or film-maker wishes to quickly convey to a non-UK audience a generic location in Britain, a popular way to do so is to show an image of the Clock Tower, often with a Routemaster bus or Hackney carriage in the foreground. This gambit is less often used in the United Kingdom itself, as it would suggest to most British people a specific location in London, which may not be the intention. The sound of the clock chiming has also been used this way in audio media, but as the Westminster Quarters are heard from other clocks and other devices, the unique nature of this particular sound has been considerably diluted. The structure has been shown in films such as The Thirty Nine Steps, V for Vendetta (which pictured the clock tower graphically exploding), Shanghai Knights, Peter Pan, 101 Dalmatians, "102 Dalmatians" (Acted), Basil, The Great Mouse Detective, From Hell, Independence Day (seen on TV), My Learned Friend, Mars Attacks!, National Lampoon's European Vacation, 28 Days Later, The Avengers, Gorgo, The War of the Worlds, and Flushed Away. It has also been shown in television shows such as Futurama, The Simpsons, Inspector Gadget, Lost, Doctor Who (particularly in The Dalek Invasion of Earth, "Aliens of London," "The Empty Child" and "The Christmas Invasion"), The Prisoner (particularly in the episode The Chimes of Big Ben (The Prisoner)|The Chimes of Big Ben), and Captain Scarlet. An image of the clock tower was also used as the logo for London Films. The sound has been featured in plays such as Stephen Sondheim musical Sweeney Todd, first heard as the title character arrives back into a London port and recurring throughout the piece, helping to maintain a sense of location. In Supertramp's song Fool's Overture, you can hear Big Ben chime the hour in a Blitz-inspired montage. The clock tower has appeared in Kingdom Hearts, part of the level relating to Disney's adaptation of J. M. Barrie's Peter Pan. In the Yu-Gi-Oh! Trading Card Game, the design of the Clock Tower Prison card is based on the tower. In the James Bond Computer Game James Bond 007: From Russia with Love, the tower housing Big Ben features primarily at the end of the first level. In the James Bond film Thunderball, Ernst Stavro Blofeld tells MI6 to have Big Ben ring seven times at six o'clock as an agreement to SPECTRE's terms. Users of the first edition of the computer game Command & Conquer had the option of destroying the clock tower - among other international landmarks - seen in a digital video. Likewise, the clock tower makes an appearance in the London mission in the Allied campaign in Command and Conquer: Yuri's Revenge. 2007's Command & Conquer 3: Tiberium Wars would once again feature the clock tower in the franchise, as a target in the initial mission of the unlockable Scrin campaign. In the computer game version of Jeff Wayne's The War of the Worlds by Rage, the Houses of Parliament and the Clock Tower (housing Big Ben) are the main base for the humans. When the building is being destroyed, the last thing left standing is the Clock Tower before the total destruction of it and the fall of London. At the end an FMV clip shows a tripod fighting machine destroying the Clock Tower hi . The tower also features in the popular PC game Sim City 4 as one of the landmarks which the player is able to place into a city. The tower is pictured on the cover of The Who's rock album The Who Sings My Generation. In the 2003 film Reign of Fire, the tower is prominently featured on the film's box cover in the background while British AH-64 Apaches do battle with a horde of dragons, who are destroying London. The tower is destroyed in the film itself, and in several scenes depicting the ruins of London, the tower is still standing but has been completely burned out. In the 2007 film Flood (film), the tower, along with other London landmarks, was shown being hit with a massive surge of water. ↑ Rosemary Hill, God's Architect: Pugin & the Building of Romantic Britain (New York: Allen Lane/Penguin, 2007), 482. ↑ Big Ben www.parliament.uk. Retrieved June 7, 2016. 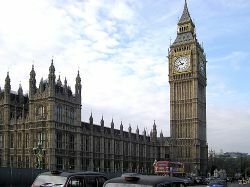 ↑ Frequently asked questions: Big Ben and Elizabeth Tower www.parliament.uk. Retrieved June 7, 2016. ↑ 1840-2012: Big Ben and Elizabeth Tower www.parliament.uk. Retrieved June 7, 2016. ↑ The Story of Big Ben Whitechapel Bell Foundry. Retrieved November 19, 2007. 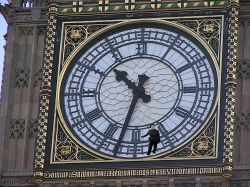 ↑ "Baby Big Ben clock part returns" BBC News July 27, 2005,Retrieved November 19, 2007. ↑ "Big Ben Chimes stoppage mystery" BBC News May 29, 2005. Retrieved November 19, 2007. ↑ In Pictures: Big Ben's Big turn off BBC News October 29, 2005, Retrieved November 19, 2007. ↑ "Bongs and Birds" BBC News June 12, 2006. Retrieved November 19, 2007. This page was last modified on 7 June 2016, at 19:40.